With over 58 active ingredients including vitamins B, E, C and A, amino acids and polypeptides that have been developed using cutting edge biotechnology, these individually wrapped vials of serums are our most potent of Targeted Sérums. 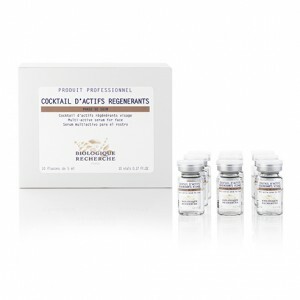 The Cocktail d’Actifs Régénérants is an over-boosted serum which reduces and prevents the appearance of fine lines and wrinkles by activating cellular regeneration and stimulating collagen and elastin production but also protects the skin from the harmful effects of free radicals by boosting the skins protective functions. Suitable for devitalised, mature Skin Instants® or anyone looking to nourish and tone their epidermis, this serum will illuminate the complexion, giving it vitality and energy. Regenerating agents: Sh-Polypeptide-1, Sh-Polypeptide-2, Sh- Oligopeptide-1, Sh-Oligopeptide-2, Copper Tripeptide-1. Moisturising agents: Amino Acids (24). Revitalising agents: Vitamins E, C, A, B7, B8, B3, B5, B6, B12. Stimulating agents: Calcium, Sodium, Magnesium, Potassium, Adenosine Phosphate Cyclic, Cytosine et Thymine, Guanosine, Coenzyme A, Nicotinamide Adenine Dinucleotide (NAD), Flavine Adenine Dinucleotide Disodium (FAD), Glucathione.